Samuel D. Babcock was a well-respected member of Manhattan's business and social circles. 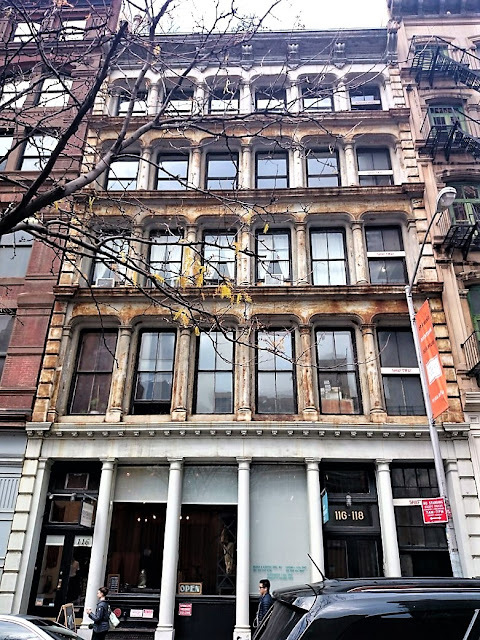 Involved in railroads, finance, steamships and insurance, he branched into real estate development as early as 1859 when he turned his focus to the changing Tribeca district. Babcock added to his significant holdings in 1870 when he purchased the two old brick buildings at Nos. 116 and 118 Franklin Street, just east of West Broadway. He commissioned the well-known architect, Griffith Thomas, to design a modern loft and store building on the site. Thomas's structure would be on the cutting edge in two ways. The French Second Empire style had taken Paris by storm only a few years earlier; and the technology required for the cast iron facade of the upper floors had only recently been perfected. The identical upper floors, each separated by a sill course, featured flat-arched openings between engaged columns. Quoins imitating stone ran from the sidewalk to the cast iron cornice, upheld by substantial scrolled brackets. LOST--On Saturday morning, in an Eighth avenue car, a Bundle, containing books. Owner of same got off at corner of Franklin street and West Broadway. A liberal reward will be paid to finder on delivering same at Nos. 116 and 118 Franklin street. The unlucky bibliophile might have worked for an accessories firm. In April 1873 a tenant was looking for "An experienced salesman to sell linen collars and cuffs." In 1876 Charles R. Duxbury moved his newly-formed Duxbury & Co. into the building. The firm supplied wholesale braids and bindings to apparel manufacturers dealers. By 1886 Duxbury & Co. was a major player in the accessories business. That year Finance and Industry said Duxbury had "developed a widespread business with connections of an influential character, while his facilities are unrivaled." The writer described the ground floor space, saying "In his spacious and centrally located salesroom in Franklin Street, is always displayed a complete assortment of every pattern, texture, width and shade, including braids and bindings for manufacturers of knit goods, blankets, shirts, clothing, etc., also supplies for manufacturers of kindred character." In November 1886 the firm incorporated, becoming Duxbury & Co. Its new president was the indefatigable Thomas C. Snedeker, with Charles R. Duxbury taking the position of treasurer. It is unclear whether the new arrangement had anything to do with pending problems; but before long The New York Times reported "In the trade it is said that the business has not been very successful" and in 1889 said "The company paid slowly during the last year, and the debts, according to the annual reports, steadily increased, while the business did not increase in proportion." Finally, on June 8, 1890 The Times ran the headline "A BRAID CONCERN EMBARRASSED--The Salesrooms of the Duxbury Company in the Sheriff's Hands." Snedeker and Duxbury put a positive spin on the news, telling reporters that "the execution was a friendly one, and that it would be settled in a day or two." It was not. Instead, Thomas Snedeker took over the business, reorganizing as Snedeker & Co. and continuing the business without its founder. His brothers, Joseph and William, were partners. Sharing the building with Snedeker & Co. in the 1890's were A. W. Hangington, engaged in "stamping and tinting linens;" Joseph Linder, supplier of "cloth samples;" and J. L. Brown & Co.
Work in apparel-related factories was not an easy life. The 16 men who worked for A. W. Hanington in 1895 worked a 60-hour week; and the dozen females who worked in Joseph Linder's shop put in 53 and a half hours. Walter W. Walsh had more immediate problems than his work schedule on his mind on January 24 1896. A traveling salesman for J. L. Brown, he worked late that night, unnoticed by coworkers who one by one went home. When he tried to leave, he discovered that he was locked inside the building. Late in the night a policeman passing the building heard a tapping noise inside. Then, according to The Sun, a man's voice yelled "Say, help me get out, will you? I've been locked in." Suspecting that he may be communicating with a burglar, the cop interviewed him through the iron door for some time before finding a ladder and managing his release. Nevertheless, Walsh was taken to the station house until his identity was firmly established. In the meantime, the Snedeker brothers diversified their firm by adding real estate development and management. 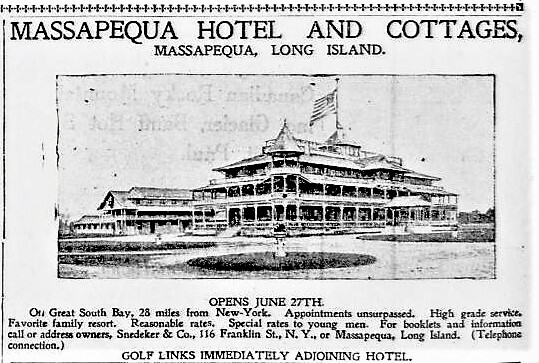 Joseph had erected the lavish Massepequa Hotel on the Great South Bay of Long Island, and "cottages" in the vicinity in 1888. Included as part of its new real estate business, Snedeker & Co. took over the management of the 300-room resort hotel by 1897. Snedeker & Co. became better known to the general public for the real estate portion of the business than for its trimmings. On August 27, 1899 the New-York Tribune reported "As September approaches the Massapequa Hotel remains well filled, and as many of the sojourners who have been so comfortable and contented during the summer are loath to go, Snedeker & Co. have decided to keep the house open well into the month." At the time of that article, the tenants at Nos. 116 and 118 Franklin Street were cleaning up after a fire on July 29. The losses totaled to about $7,750--nearly a quarter of a million today. The damage to the building may have contributed to alterations in November 1901 by architect Richard Berger. While the storefronts may have been slightly remodeled, the bulk of the upgrades were inside. That summer season Snedeker & Co. had debuted a new attraction at the Massapequa Hotel and its cottages. 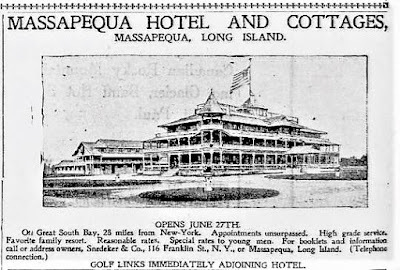 An advertisement in June noted, "Golf Links immediately adjoining hotel." It added "Special rates for young men." Abraham Vanderbilt operated his express (or freight delivery) firm in the building when, on February 25, 1902, the 66-year old died. It appears that the Snedekers were quick to move in. Among William Snedeker's directorships in 1915 was Vanderbilt & Co., still in the Franklin Street building with Snedeker & Co.
Moore & Gibson Co. published postcards and "souvenir goods" in the building through 1912. Hand tinted scenes of towns, resorts and areas of interest throughout the country enabled tourists to show the folks back home where they had been. 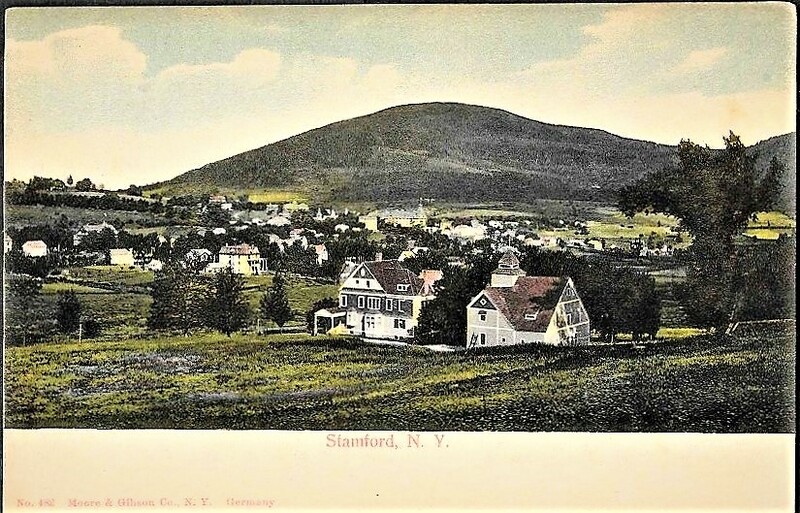 This panorama of Stamford, New York, was typical of Moore & Gibson's scenic postcards. In December 1935 linen importers Ernest-Fischer Company announced it would move into the building the following month. But the dry goods district would give way to galleries, restaurants and lavish residences in before the end of the century. A renovation was begun in 1983 which resulted in one "loft dwelling" per floor above the ground floor. A subsequent alteration completed in 2002 resulted in a duplex on the fifth floor extending into the new penthouse level, unseen from the street. The store space, where Duxbury & Co. displayed bindings and braids in the 1870's became home to Grown & Sewn's flagship store in April 2011. The boutique offered men's pants, shorts, bags and accessories. The nearly 150-year old cast iron facade has been inexcusably neglected. Rust streaks down the surface and jagged holes mar the sill courses--a seemingly cavalier disregard of a historic property by owners who can afford lavish residences inside.